I figured out how to export Tiled maps to Lua and load them directly into the game. The data format matches what I was using for my hardcoded test map, so very little needed to be changed. Added loading and displaying tiles from a tileset, and rudimentary switching between two maps / rooms with their own actors and properties. Added rudimentary animations, and added an index to actors to reference them. I spent some more time messing around with MilkyTracker, and took about an hour to check out AdLib Tracker II. I’m not sure if I’ll ever get the hang of the latter, but I sampled a couple of 2-op FM instruments for loading into MilkyTracker, and may come back to it again later for some 4-op sounds and percussion effects. GraphicsGale’s alpha channel features don’t seem to work correctly under Wine. In order for sprites to be rendered with transparency masks, I’ll first have to run them through a Pillow script to force all background pixels to have full alpha channel values. LÖVE might also be capable of setting alpha on a per-pixel basis when loading the textures. Not sure what the best way to do this would be. I don’t want extra steps between editing art files, and then viewing them in-engine. For now, I’m running a script to copy non-alpha sheets to a spritesheet directory (deleting previous contents) and apply alpha to all .png files in this directory before launching the game. The more sprite textures that become part of the game, the longer this could take. I like the idea of the user being aware of things that the in-game protagonist isn’t, simply due to the player being able to perceive things that wouldn’t necessarily be within the protagonist’s line of site or earshot. It would be great to have some trickster characters that mess with the protagonist in ways that only the player and other NPCs can notice. Likewise, the protagonist acting on information that the user can’t be aware of. Building up those kinds of gags takes time and energy, though. I think I should clean up what I’ve got so far and work on a small platformer to test out my overall workflow. A really small platformer. Small enough that it won’t be something that I can get lost in. That will help iron out problems, and also provide some practice in packaging LÖVE games for different platforms. 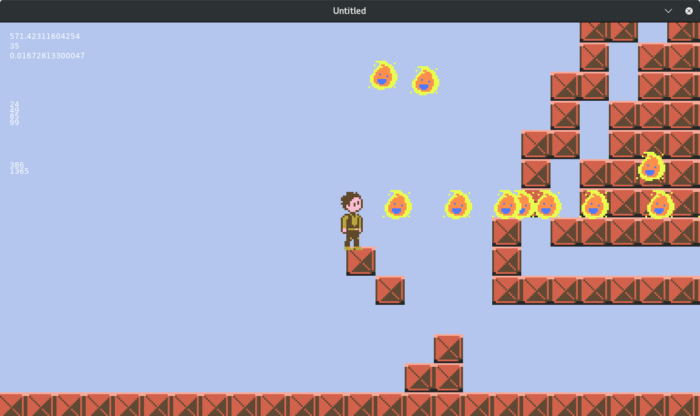 Take two weeks to refactor and clean up what I’ve written, and produce a (very) short game.